I settled into Ganze for a few days for a few reasons. First, I just liked the atmosphere. Second, there were plenty of interesting things to investigate in and around the town. And third, it’s a great place to base yourself when exploring the more remote towns of Dege, Baiyu and Xinlong. A mother and daughter walk a kora around the Tibetan monastery in Ganze, Tibet (China). 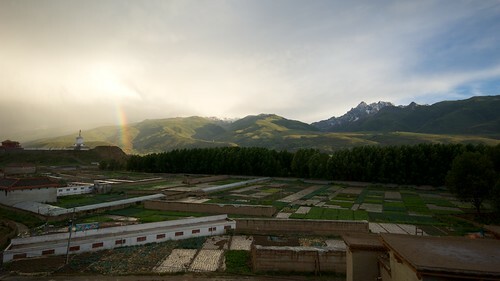 Like many Tibetan towns, Ganze is set in a grassy valley near a river and is surrounded by beautiful mountains. A short walk out of the town in any direction and you’ll find fields of barley, rolling green mountains topped with chortens, and small monasteries. 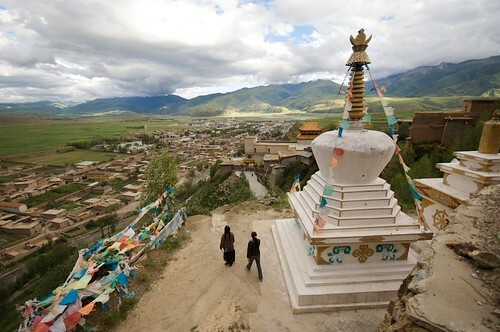 The main monastery is located to the northeast of town and is full of friendly monks. One day as I was strolling through, a monk noticed a tattoo on my arm and proceeded to show me his tattoos… all of his friends’… and pretty much anyone’s in the area. It turned into a fun afternoon of tea, crackers and attempts at communication. Monks gather before lunch on a balcony overlooking Ganze, Tibet (China). 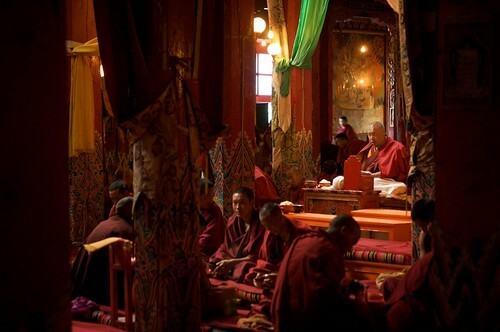 Monks chant at a monastery just northeast of Ganze, Tibet (China). Tibetan Buddhist monks take turns shaving each others' heads in Ganze, Tibet (China). On the southern end of town is a big chorten with nice views of the valley to the south and west. Natural hot springs can also be found in town down a small path near a hotel/restaurant called “The Black Horse” (I think). They’re not the most beautiful hot springs in the world but they do offer a hot bath when many of the local hotels do not. 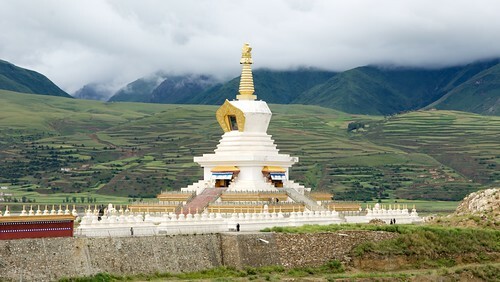 A big chorten found just south of Ganze, Tibet (China). 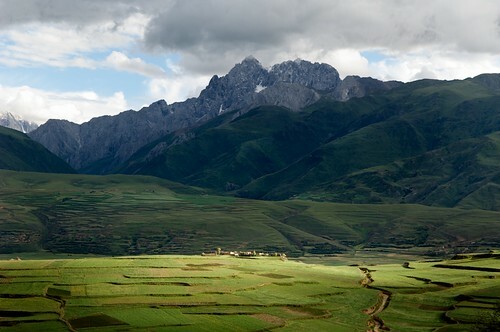 A view to the West and South of Ganze, Tibet (China). To the west of town, to the west of the bus station and over a foot bridge are some beautiful farms and fields. I spent a quiet afternoon strolling around this area and found it reminiscent of Amish farms in my native Pennsylvania. 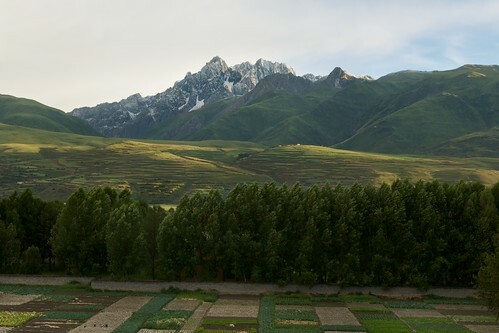 The fields and mountains to the west of Ganze, Tibet (China). The center of town can get a bit busy and dusty, but I found that many of the locals we friendly and helpful. Being a trading town, many interesting things can be found in the stores and markets. 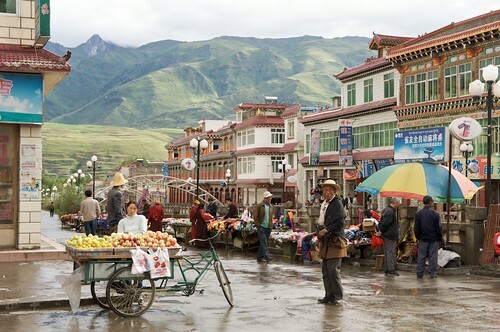 This is a good town to stock up on supplies if you’re headed deeper into Tibet or have been on the road for a while. I also found some good Tibetan souvenirs that I hadn’t seen before. Being a trading town, Ganze's center is full of well stocked markets and stores. 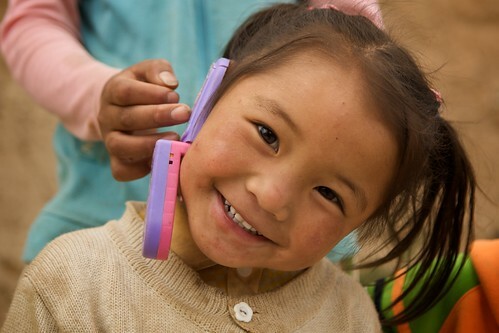 A young Tibetan girl in Ganze, Tibet (China). 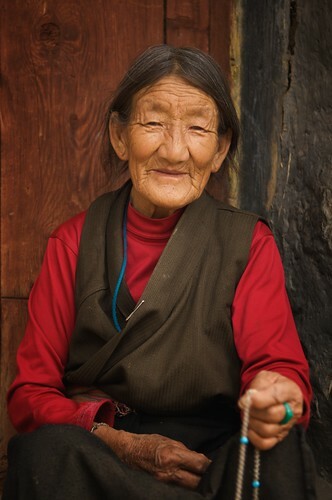 An elderly Tibetan woman sits on her doorstep in Ganze, Tibet (China). This is the fourth installment on my travels to Tibet. The next will be about Dege, and it’s holy printing monastery, and the last was about Dawu. The rest of the articles can be found here. Going through this series, I’m really starting to miss this region of Tibet. It really is a beautiful area filled with nice people. And yes, I’m from just outside Philly! My pleasure. You come from a beautiful place!